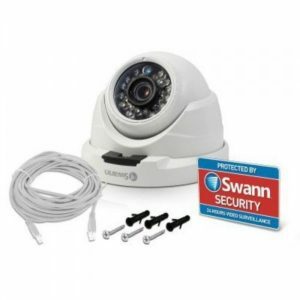 16 Channel 4K UHD NVR Security System with 8 NHD-880 Bullet Cameras Meet the ultimate in security from Swann – Ultra HD 4K surveillance technology. 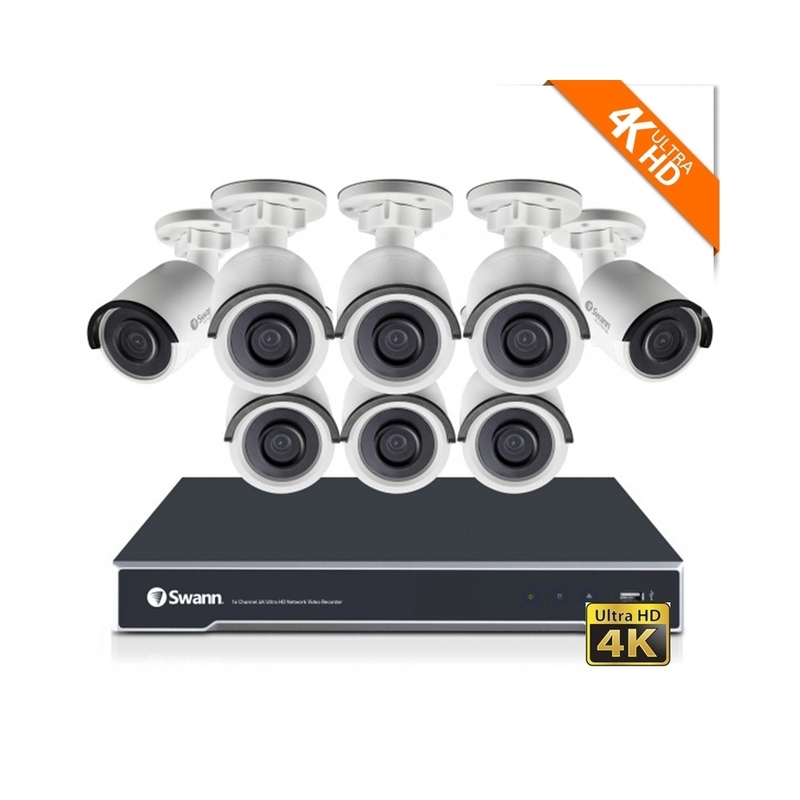 Be protected and see every detail with this expandable 16 Channel, 8 Camera 4K Ultra HD Surveillance System that can capture and record activity in never before seen clarity, Ultra High Definition. 4K is 4 times clearer than 1080p security systems and needs to be seen to be believed. Each channel is also independently configurable, so that you can capture exactly the right frame rate, image resolution and video length to know what’s happening. With a 4TB surveillance-grade hard drive pre-installed in the Network Video Recorder (NVR) you can record for up to 50 days (based on motion events 15% of the time at the lowest settings) and the latest H.265 video compression allows for fast, efficient recording and playback, that’s 40% more efficient than standard H.264. 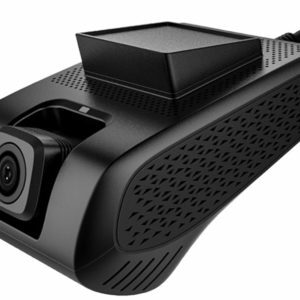 This system comes with 8 weatherproof network cameras that can be mounted indoors or outdoors and that can generate amazing 4K Ultra HD video resolution that can see close-up detail like faces, license plates, clothing colors and other important visuals. 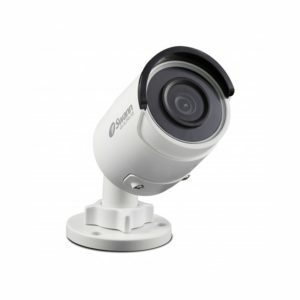 The bullet style cameras can also see further in the dark with infrared night vision up to 100 feet. 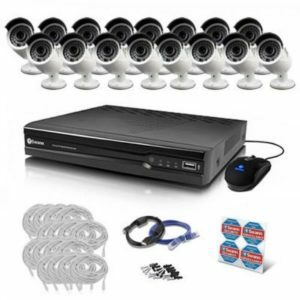 You can also add another 8 cameras for full 16 channel monitoring if you require it. 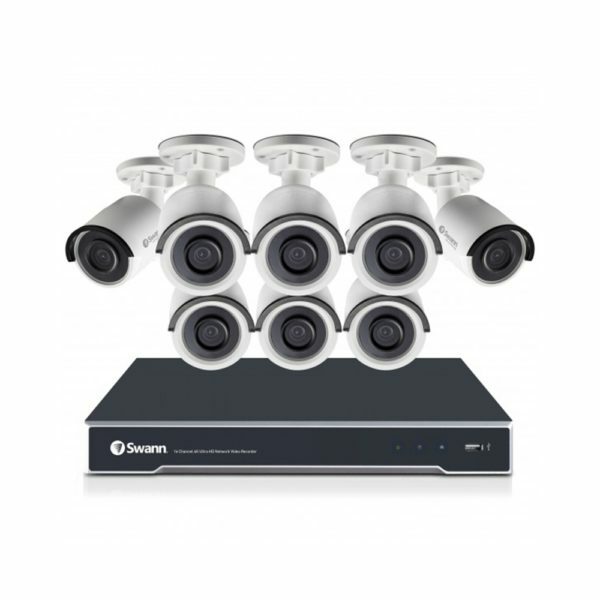 Enjoy easy set up with Power over Ethernet (PoE) for the 8 included cameras, meaning each camera draws its power via Cat 5 network cable connected to the NVR. Know what’s happening at all times on your Smartphone or tablet using the free SwannView Plus app. This system is ideal for large premises including businesses, retail stores, community centers, shopping malls, 2 storey homes and more. Be amazed at the difference 4K can make! 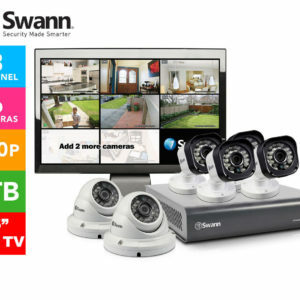 Ultra HD 4K Resolution is Here Experience the ultimate in security with the 16 Channel 8 Camera 4K Ultra High-Definition Surveillance System from Swann. You will be amazed by the stunning image quality of Swann’s 4K (or 8 Megapixel – 3840 x 2160 pixels) Ultra High Definition surveillance. 4K is 4 times clearer and superior to 1080p. The video quality is amazing, allowing you to see details and colors like never before. See facial details, license plates, eye color, dollar bill denominations and more, like never before. 8 4K UHD Cameras to See every Detail For the ultimate in protection, the kit includes 8 all-weather bullet-style cameras with powerful night vision up to 100’. 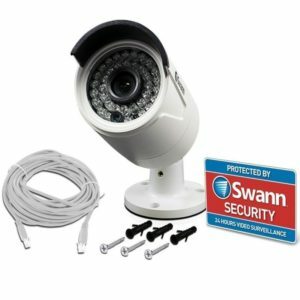 The cameras are truly weatherproof with an IP66 rating for water resistance and the cables are threaded through their mounting stands for added protection from vandalism and interference. The cameras are both ceiling and wall-mountable allowing you to find the best location and the right mix of deterrence and discretion. Get Closer with Enhanced Digital Zoom For security purposes, the real benefit of extra pixels is that it makes the cameras’ digital zoom more effective. This allows you to zoom in to capture extra detail such as license plates or facial features. The higher resolution of 4K Ultra HD can also allow you to cover a wider area with fewer cameras, knowing you have the ability to zoom into one spot in the picture if you need more detail later. A State-of-the-Art UHD NVR Puts You in the Picture The NVR is capable of recording in glorious 4K Ultra HD on all 16 channels. This allows you to see live full screen video and playback in 4K UHD with video 4 times clearer than most traditional 1080p DVRs and NVRs. Each channel is also independently configurable so that you can record for longer, and the latest H.265 video compression allows for optimized, fast, efficient recording and playback. Now you know exactly what’s happening. See More & Protect More with Wide Angle Viewing Swann’s 4K Ultra HD cameras have a super wide 75 degree field of view. Best of all, the wider viewing angle allows you to see detail you might otherwise have missed and is perfect for large areas such as yards, driveways, hallways, parking lots and more. 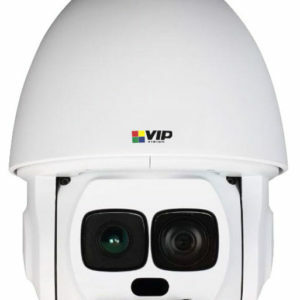 Twin EXIR LEDs for Crisper, More Even Night Vision Unlike conventional IR LEDs which display infrared light in a circular pattern that creates a ‘spotlight’ effect, each camera has twin EXIR LEDs that emit a rectangular pattern for a more uniform and even night vision image. Designed especially for security system screens, EXIR LEDs reduce over-exposure at the center of images and reduce darker areas at the corners, allowing you to see in the dark like never before. 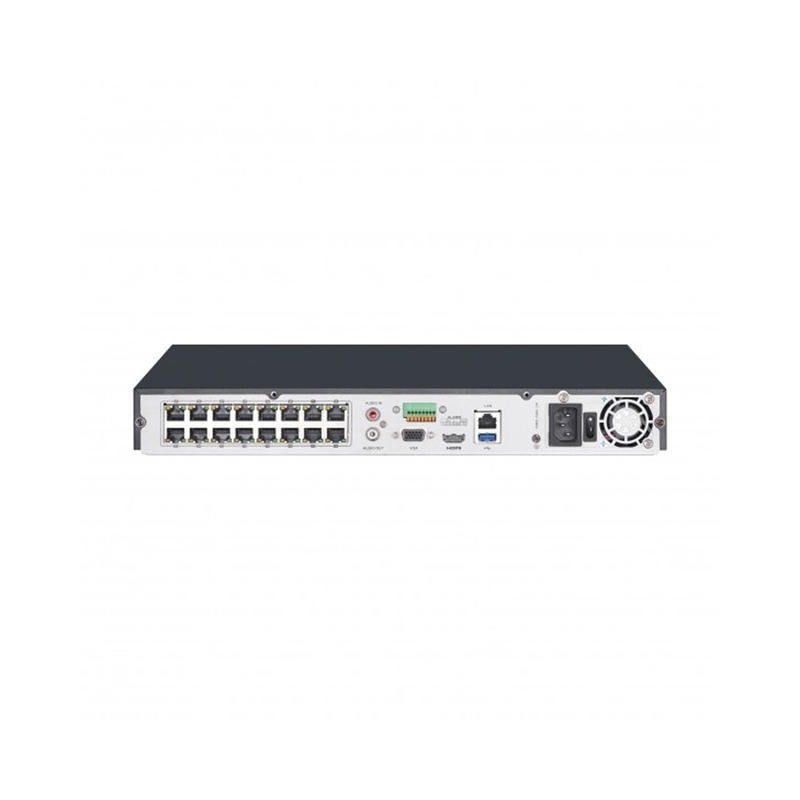 Enjoy Easier Setup with Power over Ethernet Installation and setup is now easier than ever with 16 PoE (Power over Ethernet) ports on the NVR allowing both the digital video signal and power to run from the NVR to the cameras through the same cable. Simply run one of the included 60′ CAT5 Ethernet cables per camera to the NVR and click it into place the same way you would connecting your computer to a router or network. When you want to expand you can add 8 extra cameras to the 8 spare PoE network ports at the rear of the NVR – it really is that easy. View Activity on Your HD TV or Monitor The kit also includes a 6ft HDMI cable for generating up to 4K Ultra HD video to your flat screen TV including LCD, LED TVs or monitors. The NVR also has a VGA connection for viewing (up to 1080p) on your LCD monitor or compatible TV with PC (VGA) input (VGA cable not included). 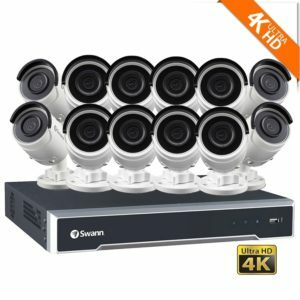 Expand the System if You Need to You can expand this system by adding up to 8 extra Swann 5MP or 4K Cameras for full 16 channel monitoring to see what’s really happening. Imagine being able to see 16 locations around your premises so that all the important angles are covered including stairwells, back entrances, storerooms, yards, gates, side entrances and more. Long Recording with 4TB Security Hard Drive A massive 4 Terabyte SATA hard drive, designed especially for surveillance, is pre-installed to allow up to 50 days of motion-activated recording (based on motion events 15% of the time at the lowest settings). If an incident occurs you can transfer video files to back-up media via the easily accessible USB port at the front of the NVR. Know What’s Happening with New Smart Alerts Swann’s 4K Ultra HD has the latest software analytics including facial detection for accurate alerts and recording of people. Know when a person enters or leaves a scene and you can set up zones, such as around doorways and porches, and know if someone enters or leaves that zone. The system also allows you to set a line on a screen, such as a fence line or entrance way, and detect if someone crosses that line. It will also detect if a camera is out of focus, tampered with or the lens is covered. If a positive trigger occurs you can customize the response including commencing recording from a single camera or multiple cameras, sounding an audible alarm, moving to full screen mode on your monitor and/or sending you an email with an alert message. It’s all easy and intuitive to set up and use. Getting Started is a Breeze Setting up the NVR for remote viewing over the internet has never been easier with SwannLink peer-to-peer technology. Connect to your router or network using the included Ethernet cable then scan the NVR’s QR code to get connected. Once you have downloaded the SwannView Plus app you can scan the same QR code to begin viewing on Smartphone or tablet in a matter of minutes. View Your Home on Your Phone Best of all you, you will be able to see and know what’s happening at all times. The free SwannView Plus app can be viewed on Smartphone or tablet and both are free from the App Store for iPhone and iPad or Google Play for viewing on Android devices. With the ability to see all the cameras live from anywhere in the world, peace of mind is always at your fingertips.